Description: Sexes similar. Dark, glossy greenish-blue above, greener in fall plumage; white below. 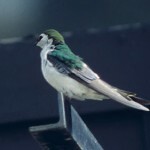 White cheek patch does not extend above eye as in Violet-green Swallow. Juvenile is gray-brown above; white below; and usually with a dusky breast band, more diffuse than in Bank Swallow. First-spring female shows varying amounts of adult color on crown and back. Habitat: Open woodlands, usually fairly close to water. Favorite nesting sites include woodpecker holes in dead trees and bluebird houses. 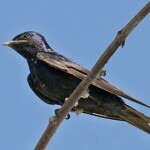 Where in Nebraska: Common spring and fall migrant and summer resident in eastern Nebraska, becoming rarer westwardly. 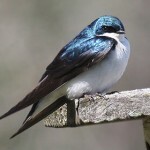 Field Notes: Generally migrates north earlier in the spring, and lingers farther north in the fall than other swallows. 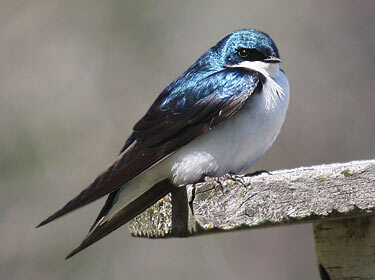 Fun Facts: Tree Swallows use the feathers of other birds to line their nests to help keep the nestlings warm.